Anyone looking for a frustrating yet occasionally hilarious Flash game to while away their Tuesday evening? Try QWOP, named so for its simple control scheme using the Q, W, O and P keys on your keyboard. Those four keys control the thighs and calves of "our small nation's sole representative at the Olympic Games." It quickly becomes clear why no games have ever employed this control scheme for running purposes before. 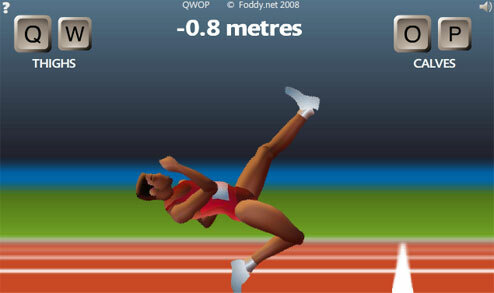 My personal best was a nation shaming 10 meters, at which point Qwop landed face first, snapping his right leg in half. Everyone is a winner! I got to 54.3 Meters. Only failed because there is a hurdle right on the 50 meter mark. It took me FOREVER to get there!